Today’s financial markets are built on the sand of unsound currencies. Consequently brokers, banks and investors are wedded to monetary inflation and have lost both the desire and ability to understand gold and properly value it. Furthermore governments and central banks in welfare-driven states see markets themselves as the biggest threat to their successful management of the economy, a threat that needs to be tamed. This is the backdrop to the outlook for the price of gold today and of the forces an investor in gold is pitted against. At the heart of market control is the substitution of unsound currency for sound money, which historically has been gold. 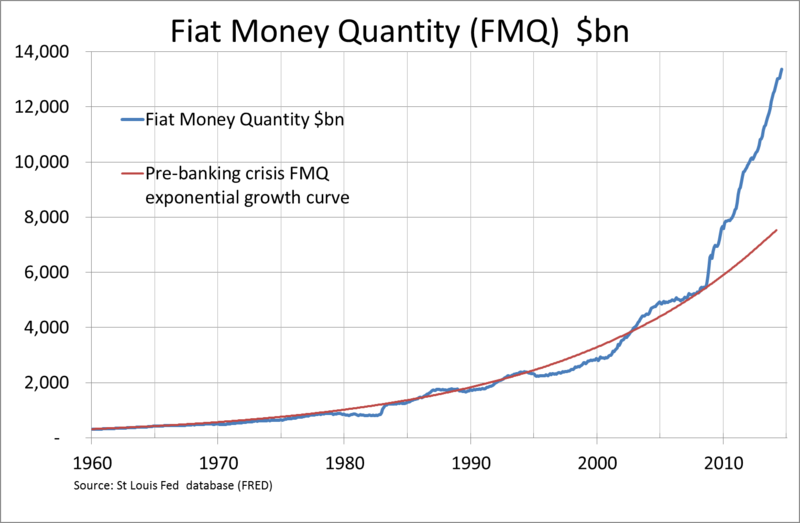 Increasing the quantity of currency and encouraging banks to increase credit out of thin air is the principal means by which central banks operate. No matter that adulterating the currency impoverishes the majority of the population: central banks are working from the Keynesian and monetarist manual of how to manage markets. In this environment an investor risks all he possesses if he insists on fighting the system; and nowhere is this truer than with gold. Gold is not about conventional investing in this world of fiat currencies, it is about insurance against the financial system collapsing under the weight of its own delusions. Regarded as an insurance premium against this risk, gold is common sense; and there are times when it is worth increasing your insurance. In taking that decision, an individual must be able to evaluate three things: the relative quantities of currency to gold, the likelihood of a systemic crisis and the true cost of insuring against it. We shall consider each of these in turn. Not only has the quantity of global currency and bank credit expanded dramatically since the Lehman crisis, it is clear that this is a trend that cannot now be reversed without triggering financial chaos. In other words we are already committed to monetary hyperinflation. Just look at the chart of the quantity of US dollar fiat money and note its dramatic growth since the Lehman crisis in 2008. Ask yourself a question: how much would interest rates have to rise before a systemic crisis is triggered? The clue to the answer is illustrated in the chart below which shows how lower interest rate peaks have triggered successive recessions (blue shaded areas are official recessions). The reason is simple: it is the accumulating burden of debt. The sum of US federal and private sector debt stands at about$30 trillion, so a one per cent rise in interest rates and bond yields will simplistically cost $300bn annually. The increase in interest rates during the 2004-07 credit boom added annual interest rate costs of a little over double that, precipitating the Lehman crisis the following year. And while the US this time might possibly weather a two to three per cent rise in improving economic conditions, much less would be required to tip other G8 economies into financial and economic chaos. By this we mean the real price of gold, adjusted by the rapid expansion of fiat currency. One approach is to adjust the nominal price by the ratio of US dollars in circulation to US gold reserves. This raises two problems: which measure of money supply should be used, and given the Fed has never been audited, are the official gold reserves as reported to be trusted? The best option is to adjust the gold price by the growth in the quantity of fiat money (FMQ) relative to the growth in above-ground stocks of gold. FMQ is constructed so as to capture the reversal of gold’s demonetisation. This is shown in the chart below of both the adjusted and nominal dollar price of gold. Taken from the month before the Lehman collapse, the real price of gold adjusted in this way is $550 today, based on a nominal price of $1220. So in real terms, gold has fallen 40% from its pre-Lehman level of $920, and has roughly halved from its adjusted high in 2011. • We already have monetary hyperinflation, defined as an accelerating debasement of the dollar. And so for that matter all other currencies that are referenced to it are on a similar course, a condition which is unlikely to be halted except by a final systemic and currency crisis. • Attempts to stabilise the purchasing power of currencies by raising interest rates will very quickly develop into financial and economic chaos. • The insurance cost of owning gold is anomalously low, being considerably less than at the time of the Lehman crisis, which was the first inkling of systemic risk for many people. So how is the global economy playing out? 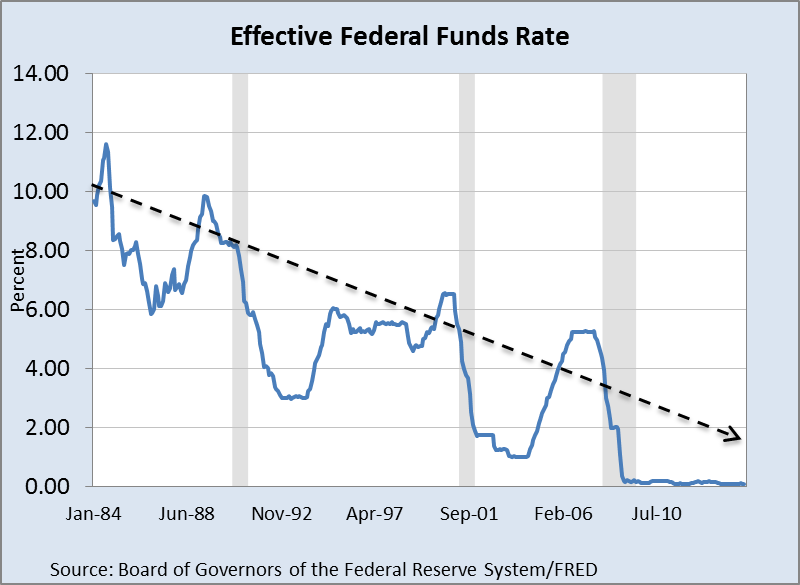 If the economy starts to grow again a small rise in interest rates would collapse bond markets and bankrupt over-indebted businesses and over-geared banks. Alternatively a contracting economy will increase the debt burden in real terms, again threatening its implosion. So the last thing central banks will welcome is change in the global economic outlook. Falling commodity prices and a flight from other currencies into the dollar appear to be signalling the greater risk is that we are sliding into a global slump. Even though large financial speculators appear to be driving commodity and energy prices lower, the fact remains that the global economy is being undermined by diminishing affordability for goods and services. In other words, the debt burden is already too large for the private sector to bear, despite a prolonged period of zero official interest rates. A slump was halted when prices collapsed after Lehman went bust; that time it was the creation of unlimited money and credit by the Fed that saved the day. Preventing a slump is the central banker’s raison d’être. It is why Ben Bernanke wrote about distributing money by helicopter as the final solution. It is why we have had zero interest rates for six years. 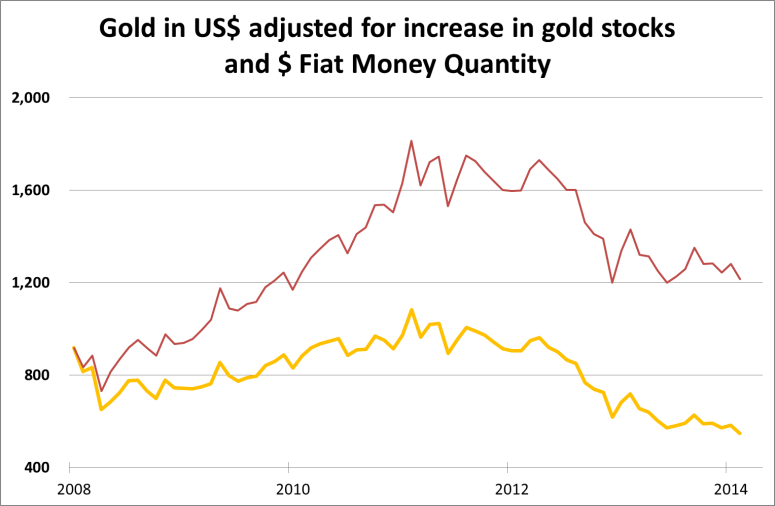 In 2008 gold and oil prices fell heavily until it became clear that monetary stimulus would prevail. Equities also fell with the S&P 500 Index down 60% from its October 2007 high, but this index was already 24% down by the time Lehman failed. The precedent for unlimited creation of cash and credit has been set and is undisputed. The markets are buoyed up by a sea of post-Lehman liquidity, are not discounting any trouble, and are ignoring the signals from commodity prices. If the economic downturn shows any further signs of accelerating the adjustment is likely to be brutal, involving a complete and sudden reassessment of financial risk. This time gold has been in a bear market ahead of the event. This time the consensus is that insurance against financial and systemic risk is wholly unnecessary. This time China, Russia and the rest of Asia are buying out physical bullion liquidated by western investors. We are being regularly advised by analysts working at investment banks to sell gold. But bear in mind that the investment industry is driven by trend-chasing recommendations, because that is what investors demand. Expecting analysts to value gold properly is as unlikely as farmers telling turkeys the truth about Thanksgiving. Next articleDoes low US price inflation provide room for a more aggressive Fed?